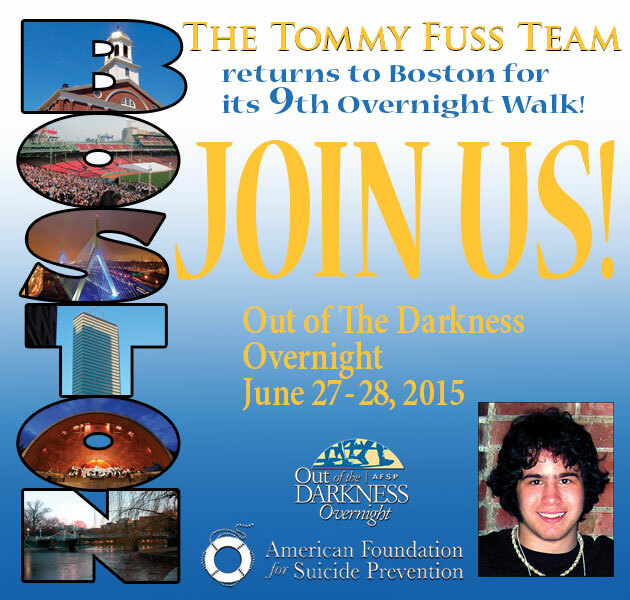 The Tommy Fuss Team returns to its home base in Boston for its 9th Overnight Walk this June 27-28. To date sixty-one individuals have crewed or walked nearly 2,000 miles (in 18 mile increments) from Dusk till Dawn to raise awareness, remove stigmas and raise money. Each year we walk to remember and honor our beloved Tommy, and all those whose lives have been lost to suicide. Have we made progress? Yes, certainly. Is there still more to do? The answer is the same. The Overnight Walks have become a nationally recognized event. A new dialog is beginning about the causes of suicide. And about effective treatment for the prevention of suicide. Please consider supporting one of our walkers, each of whom has pledged to raise $1,000 for the important work of the American Foundation for Suicide Prevention. Click their thumbnail image to go directly to their fundraising page. For the 2015 Overnight Photo Gallery, go here! As part of Loomis Sayles’ corporate sponsorship of the 2015 Boston Overnight Walk, they are sponsoring these walkers. To support them, please consider a donation to one of the Walkers listed above thus supporting the efforts of the Tommy Fuss Team and the American Foundation for Suicide Prevention.